At Reel Simple Fly Fishing, we educate people in the sport of fly fishing while having FUN! 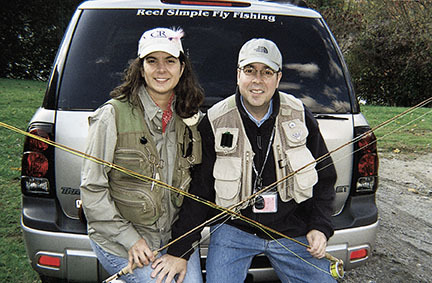 Glenn and Andrea Van Benschoten have been fly fishing the lakes and ponds of northern New Jersey as husband and wife for close to two decades. With a professional background in education, the couple has focused much of their time instructing newbies through magazine articles, demonstrations and lectures throughout the northeast on a sport that can seem overwhelming to a new angler. The Vans have also authored a book “Ten Ties, Simple Flies,” which gives the newbie ten basic flies that can be used on a variety of species while utilizing and reinforcing a few fundamental techniques to tie them. As residents of North Jersey, Glenn and Andrea take advantage of the many lakes and ponds of the area to fish for bass, muskie, pickerel and more on fly while still getting on smaller streams for trout. Glenn is a certified New Jersey educator and Andrea has served as a casting instructor and retreat leader with Casting for Recovery. Both have worked with the Hooked on Fishing, Not on Drugs program in New Jersey.